This course is all about getting you comfortable enough in and around a kayak to hop on the opportunity to paddle when it arises. This course is located in Westerville Community Center's Pool so you can learn the basics in a controlled, warm environment. These are small classes, no more than 8 students, so it is a great time for specialized instruction that goes beyond the basics. Need a ride? Meet us at Clintonville Outfitters at 4:15 and send Erin an email at erinsherrets@gmail.com to let us know you are riding along in our 12 passenger Adventure Van. If you need anything the day of the course, call Erin at 937-554-8048. 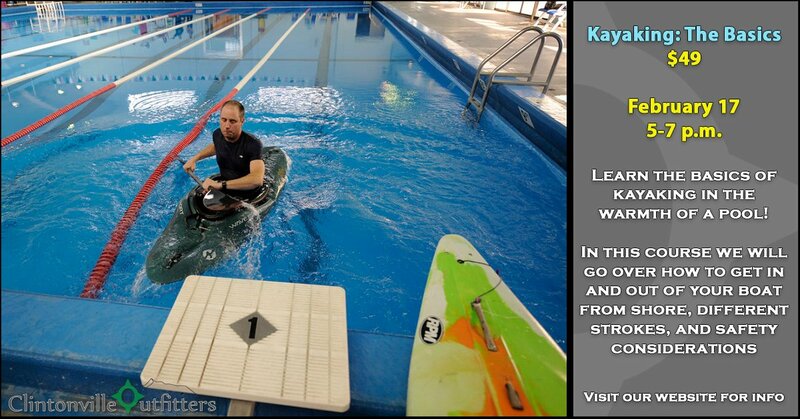 Includes instruction from ACA certified instructor, kayak, paddle, and lifejacket.